FAMILY and friends of a four-year-old who is in desperate need of an operation to change her life tackled the Great South Run yesterday. Malaya Rose from Portsmouth suffers from Quad Spastic Diplegia Cerebra which means she has tight muscles in her body making movement and coordination a real challenge from her. She needs a Selective Dorsal Rhizotomy operation to rid her muscles of spasticity and tone and enable her to be able to sit, stand, walk and play like a normal little girl. Relatives and family friends laced up their running shoes to run ten miles in a bid to raise some of the £42,000 needed for her operation and post physiotherapy sessions which is not available on the NHS. Kristine posts about Malaya’s day to day routine and her progress. Friend Leilani Cleaver and her son Elijah ran the mini race on Saturday and Jamie Appleby, Maria Appleby, Rosie May, Grandad Tony Neil and Joey Huggett all ran the main race on Sunday. Leilani, 30, said: ‘She is a really lovely little girl and absolutely adorable and we think it is so important that she gets the operation that she needs. ‘So far we have raised more than £26,000 overall with events like this and we have held car boot sales, garden parties, hikes and Jamie shaved his beard which is amazing because he loves his beard. The team of runners were among 20,000 others who ran in the sunshine yesterday and passed city landmarks including the HMS Victory along the running route. 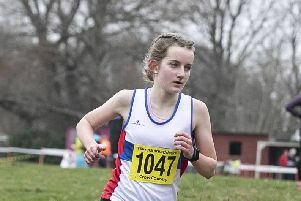 Mum Marie Appleby was also injured after pulling her ankle during practice runs but fought through to finish the race.